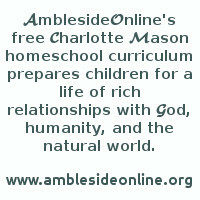 The Bible is the very first book listed in every grade level of the AmblesideOnline curriculum. Most of us can readily agree to this as the first choice among books. But there's a little note attached that sometimes raises a question: "It is preferable for a child to become accustomed to the language and flow of the KJV, as a familiarity with King James English will make other literature more accessible." Readers who still have their King James Bibles from childhood (personalized long ago with bumps, creases and highlighted passages) will most likely read that little note and nod their heads in hearty agreement. Others, however, may simply wonder, "Why? What difference does a choice of Bible versions make in a school curriculum?" It's not a surprising question, really, because the proliferation of Bible versions in the past few decades places today's parents among the first generation in almost 400 years wherein most have never read the King James Bible. So it's a question that deserves an answer: Why the KJV? First, please understand that the answer, as it concerns the issue at hand, is not a matter of textual controversies or manuscript debates. Decisions about which version a) is the more correct translation or b) will most readily help your child understand the truth of God's Word, should be approached individually, intellectually and prayerfully. However, in pursuing a literary education, there is a third issue: Will one version stretch our children's thinking skills, and elevate their ability to understand works of classic literature, better than another version? Okay, so . . . why the KJV? The KJV was penned at the pinnacle of English writing style, and it served as a common fount of influence for classic authors for over three hundred years. For this and other reasons we'll explore, the KJV stands alone as being uniquely suited to serve as our "prime spine" in a classic literary curriculum. The way children encounter information today is changing. As image-based information becomes more prevalent, our cultural mastery of language is eroding. In response, modern schools move toward materials and methods that are more image-based, and less language-based, than those used in the past. However, the watered-down English that modern children typically encounter is by no means a worthy wrestling partner. On our way toward understanding why the KJV is a primary foundation for modern readers of great literature, we must first note that the master tool of a literary education, the English language, has become peculiarly fluid in our day. English has always been remarkable among languages for its flexibility -- its capacity to evolve over centuries according to need. However, this new millennium finds the language in rapid flux. Technology, the mass media and other influences force newly-morphed words upon the language at warp-speed, while various fields and interests, ever multiplying, continuously spawn their own specialized vocabularies. At the same time, as our hurried postmodern ears grow more itchy for sound-bites than for rich, exact language, we've gradually lost thousands of precise and useful words from common use. Dictionaries require revision with increasing frequency, as publishers find that trying to define what has perhaps become undefinable -- "standard" English -- is rather like trying to paint the definitive portrait of a chameleon. Which brings us back to the matter at hand . . . In sharp contrast to the slippery state of language in our day, the King James Bible was translated during the singular window of time when the English language was at its zenith in terms of stability, as well as eloquence. Scholars and writers of that era possessed deft command of the nuances of grammar and syntax, because their educations were rooted firmly in the study of the static ancient languages of Latin and Greek. This served to standardize and inform elements of style and usage in their writings, to broaden and elevate content, and to produce a rich, colorful tapestry of vocabulary in their works. Their prose and poetry is agile, expansive, exacting, lyrical, bracing. English in the days of King James and Shakespeare was high art, in both product and form. And so it happened that the King James Bible was translated by scholars of a uniquely verbal, word-dependent age. We can scarcely imagine such an age nowadays, utterly devoid as it was of our modern dependence on image-based information. Absent our ubiquitous glut of flickering screens, visual media and instantly available music, we sense that mere words in that day more truly tickled the eye and ear. A fresh page of written words commanded eager, vigorous attention, being the sole cultural transport of news and ideas aside from word-of-mouth. Vocabulary was a craft; more lithe, richer in breadth and depth, more colorful. Sentence construction was an art form in itself! This richly verbal culture sparkled for a moment on the timeline of civilization, and flung forth a galaxy of literary minds the caliber of which the world will not likely produce again. The crumbs that fell from their tables have sustained every subsequent generation of authors. So why is this important to you and me, all these centuries later? The King James Bible is uniquely foundational to Western literature. Take a quick glance through those lists of "Great Books" we all stew over when planning school terms, and mentally highlight the titles written between roughly 1611 and 1930 (which will be the vast majority!). Can you think of one thing most of those books have in common? It's this: most of their authors were intimately familiar with the King James Bible. The result? Its influence is inextricably woven into their works, informing their phrasings, illuminating their expression, and burying treasure chests of meaning beneath the surface of their words. Those great minds of that halcyon era are the backbone, breath and muscle of the books employed in advanced literary curriculums such as AmblesideOnline and House of Education Online. These are the minds daily appealing to your child's mind, whose great thoughts and ideas your child is continuously narrating and absorbing. And the majority of those authors share the KJV as a common fount of thought, tone, ideas, construction, phrasings and references. Therefore, as your children become more familiar with the KJV, they will also become increasingly more at ease with an expansive body of great literary works. It's like having the map to buried treasures. Classic books are steadily moving beyond the grasp of modern readers. A widening language chasm cruelly threatens to separate us from our own cultural treasures. By choosing the KJV, we bridge that chasm, and in crossing over find ourselves strolling amidst wise and benevolent giants. This phenomenon is also well-known among adult readers who study Charlotte Mason's writings together in groups. In the many years I've participated in these studies, I've seen it noted repeatedly that KJV readers have a head start toward accessing the depths of Miss Mason's ideas. She was a daily reader of the KJV throughout her life, and thus her writings are richly sprinkled with phrases, metaphors and references lifted directly from its pages. If we come upon these references in a ready state of familiarity with their source and the underlying context it provides, we may readily make the leap to her meaning. This is precisely that science of relations she urges us toward! And this is that ease, that ready "Aha!" of a connection well-made, which we seek for our children in their literary journeys. And yet, despite the sure benefits, perhaps you still fear the KJV will be unapproachable for you and your children. After all, we've been barraged by publishing marketers with the notion that the KJV is just too hard for us (despite the fact that it was originally purposed as a Bible for the common man!). Do you note the curious double standard afoot here? It seems we do not hesitate to set our children upon a daunting course of Latin to expand their vocabulary and grasp of great literature; we enthusiastically endorse a steady course of "real" Shakespeare; we hand our children old, weighty volumes such as Bulfinch's Mythology and Plutarch's Lives because they are bedrock foundations of Western literature. Why, then, do we look upon the King James Bible, which offers similar language experience as well as unexcelled, broadening literary enrichment, with fear and hesitancy? How curious, really, that modern believers, especially those among us who claim to relish great literature, should look upon this crowning literary achievement of the Christian era as a distant and unapproachable relation! No need to keep your distance: the KJV is a truly accessible work. After all, it was the Bible of common folk for over three hundred years, read by peasant and scholar alike. And its effect was powerful -- the church in that period flourished. Here we have the most universally beloved and captivating book in Western history, and we should be reassured to note that if all those legions of readers could handle it, surely we may expect to as well. But what if your children are already accustomed to a more recent version? Is it too late to get comfortable with the KJV? Any exposure is better than none. The younger the better, since language is assimilated with more ease at early ages. But even if your children are older, don't despair. Once children begin to hear the KJV read regularly, it's just a matter of time before the strangeness fades and the language rings familiar. Every little effort you make will strengthen your children toward a comfortable familiarity with King James English. It may not happen overnight, but be encouraged that the human mind is adaptable and can rise to most challenges. You'll soon find great pleasure in that "fine roll of Bible English," and find the KJV a familiar friend who unlocks many once-mysterious literary passageways for you. Your children will begin making those delightful "Aha!" connections with KJV allusions in their books (indeed, everywhere!) . . . buried treasure which otherwise would have passed by unclaimed. So . . . Why the KJV? Because when you walk amidst giants, it's good to keep up. Some ideas to choose from to help you ease the transition . . .
~Begin to choose memory verses from the KJV. Studies have shown that it is more easily memorized than other versions, due to its rhythm and meter - that "fine roll" to which Miss Mason referred. ~Continue for a time with your current version for daily Bible study, and add a brief oral reading of the KJV Psalms each day. Read passages such as the Ten Commandments, the 23rd Psalm, the 100th Psalm, the birth of Christ in Luke, the Beatitudes, the various parables, the Sermon on the Mount, "The Lord's Prayer," and others such as John 3:16, Galations 5:22, and Philippians 4:8. Later, you may wish to journey into Isaiah, which flows with lyrical and poetic language. ~Consider "weaning off" by using the KJV along with the version your children are accustomed to, reading the same passage from both so they can compare and pick up unfamiliar phrases. ~Have morning readings of familiar Bible stories from the KJV, followed by a bedtime reading of the same passage from a good, literary story Bible, like the one by Catherine Vos. In this manner, the story Bible essentially provides a narration of the daily Bible reading. ~Many children have benefitted greatly from listening to audio recordings of the KJV by seasoned professional readers like Alexander Scourby. "The World's Greatest Stories from the World's Greatest Book" is a series of recordings by storyteller George Sarris, reading word-for-word from the King James text. These amazingly vivid readings are widely available from various homeschool vendors and Christian bookstores. My children have enjoyed them for years. ~Although most difficulties with King James language can be overcome with context clues, it's helpful to keep a good (and preferably old) dictionary at hand, such as Webster's 1828 Dictionary. Definitions from Webster's 1828 may be searched online at http//www.christiantech.com/. Another good choice is the Oxford Dictionary, which is unique in that it gives word histories, and thus can often helpfully illuminate what a word meant in the early 1600's. (1) See the book "Endangered Minds: Why Children Don't Think And What We Can Do About It" by Jane M. Healey, PhD., for more information on brain development studies.